As I write, in 8 hours time, a millennium of history is about to be reversed. I’m glad you asked, because we are now witnessing the beginning of an incredible fulfilment of prophecy – something that everyone should know about. To understand why it is so important, we need to go back to Nebuchadnezzar image in Daniel chapter 2. The image of Daniel 2 (seen in the centre of the image above) represents the successive kingdoms of men that existed synonymously with the nation of Israel. The legs of Iron represented the Roman Empire which eventually had an Eastern and Western component seen in the two legs. Daniel 2:42 describes the latter day component of the image, the feet, which also contain Iron and therefore the Roman element. Revelation also draws on Daniel to give us more detail about this latter day entity – this is explained briefly here. 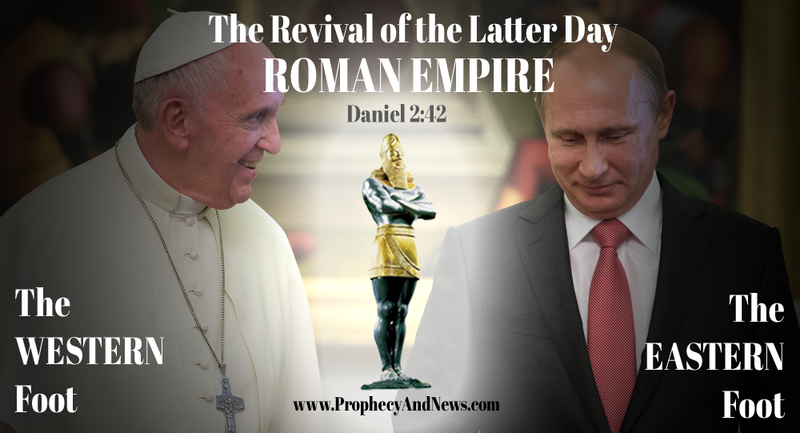 Both prophecies require that the Roman Empire be re-formed in the latter days, around the time that Israel is re-established as a nation in their own land. While Russia is not yet in Constantinople (currently under the control of Turkey) it increasingly looks as though Russia and Turkey are about to have an armed conflict which could well see Russia taking the ancient city. Interestingly, a number of sources suggest that todays meeting was initiated by Putin himself. If this is true, it seems to be timed well with the Russian-Turkish crisis. Today’s meeting will set the tone for further unification between East and West, between the two feet that will form the latter day representation of the Kingdom of Men. Putin is on the verge of fulfilling the ancient Russian dream of reviving the ancient Roman/Byzantine empire in Constantinople and completing the image. Well written. Keep up your positive work! !